Oct. 31, 2013: Some Halloweens are scarier than others. That's exactly what happened. From Oct. 19th through Nov. 7th 2003, there were 17 major eruptions on the sun, including a record-setting X28 flare. 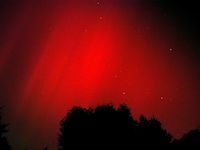 One after another, CMEs (coronal mass ejections) slammed into Earth's magnetosphere, causing geomagnetic storms and Northern lights seen as far south as Florida and Texas. On Halloween itself, many trick or treaters witnessed blood-red auroras--very spooky indeed. At the peak of these "Halloween Storms," as solar physicists began to call them, airlines had to re-route polar flights to lower latitudes, the power went out in parts of Sweden, and more than half of NASA's satellite fleet experienced problems ranging from temporary shut-downs to permanent damage. The FAA's Wide Area Augmentation System (a network of radio transmitters that improves GPS navigation for aircraft) was offline for approximately 30 hours due to the storm, and the Japanese ADEOS-2 satellite was severely damaged. Fast forward 10 years to October 2013, and the sun is storming again. A week before Halloween 2013, a new coven of big sunspots appeared. To date (Oct. 31st), they have unleashed more than half a dozen major flares including four X-class events. Earth is not experiencing the same kind of effects as ten years ago, however, because the eruptions have not been as energetic and, moreover, most of them have missed our planet. This makes the Halloween Storms of 2013 less scary than their 2003 predecessors. An X2-class solar flare recorded by NASA's Solar Dynamics Observatory on Sept. 29, 2013. "This spate of activity is inconsequential when compared to the 2003 events,” recalls Joe Kunches, a longtime forecaster working at NOAA’s Space Weather Prediction Center in Boulder CO. He points out that geomagnetic storm indices now are an order of magnitude smaller than they were ten years ago. Nevertheless, the current storms are remarkable because they are the "flariest" thing to come along in a while. Solar activity waxes and wanes in 11-year cycles. In 2003, the sun was ramping down from a strong Solar Max. The potent Halloween storms of that year were, if not actually predicted, at least not surprising. 2013 is different. The current solar cycle is one of the weakest in a century. This makes the mini-Halloween Storms of 2013 a bigger surprise even as they do less damage. Also mitigating the damage in 2013 is a decade of improvements in space weather forecasting. 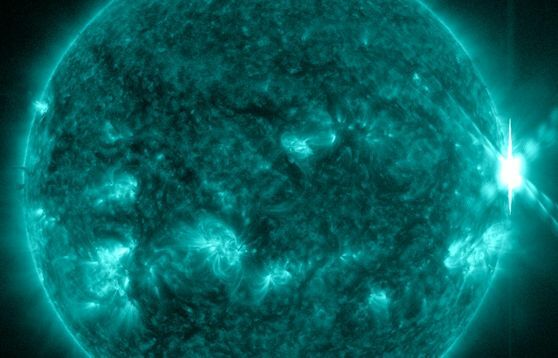 Using data from NASA science spacecraft such as the twin STEREO probes and the Solar Dynamics Observatory, NOAA analysts are able to predict the arrival of solar storms with better accuracy than ever. This gives satellite operators, NASA mission controllers, and airline flight planners extra time to safeguard life and property. Ultimately, the ending of this spooky tale may require a re-write. Why? Because it's not over yet. As Halloween 2013 comes and goes the sun is still peppered with large and active sunspots. One of them may yet send a powerful flare and CME directly toward us, sparking storms akin to the ones from a decade ago. When you knock on the door and shout “trick or treat”, you never know what you might get when the door opens. The sun is much the same way.